Prepare to have your world rocked. 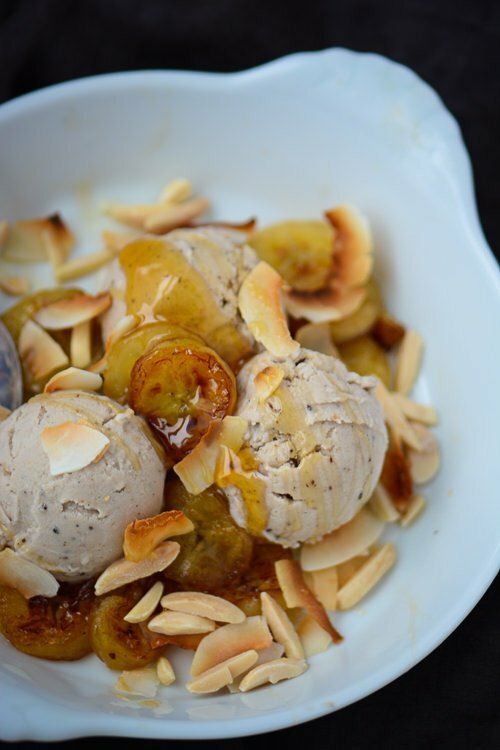 A few simple ingredients and you are looking at the best ice cream sundae you’ve ever tasted. 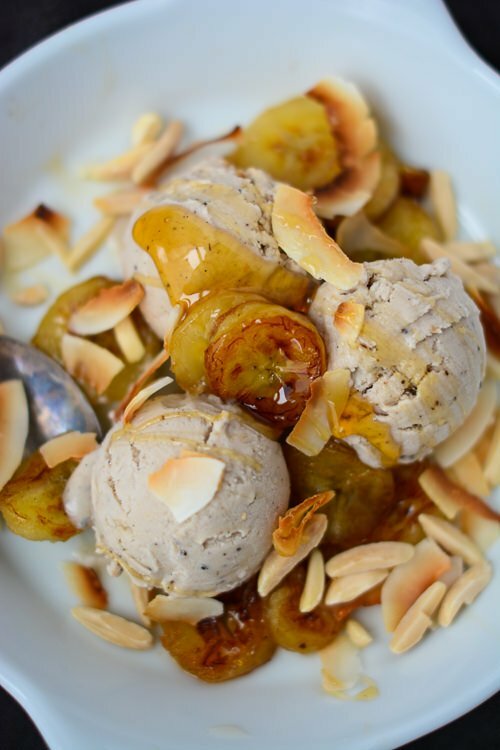 This sundae has it all covered, roasted banana ice cream, caramelized honey bananas and crunchy toasted almonds and coconut. And did I mention that it’s vegan as well? If you don’t do honey substitute with maple syrup. Don’t try to use lite coconut milk for this recipe or your ice cream will be too icy and not have the best texture. If you are feeling a little lazy and don’t care about it being vegan just make the sundae with your favorite vanilla ice cream. 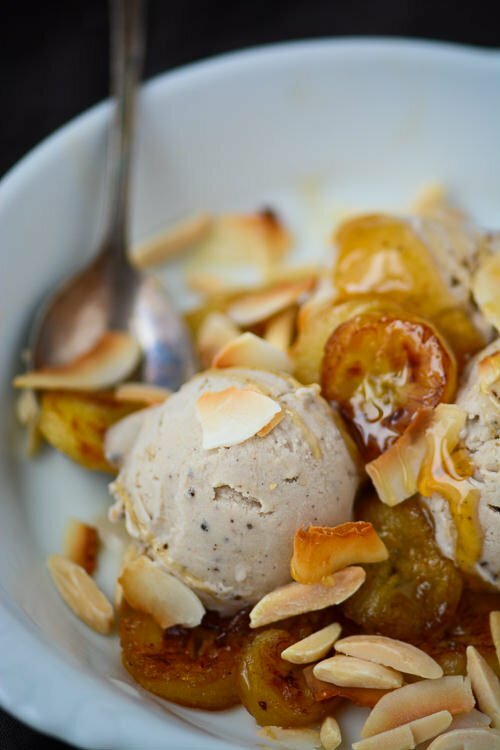 The natural sweetness of the bananas don’t need a lot of doctoring but the honey pushes it into the realm of dessert and the almonds and coconut add some great texture. Even though I had one of these for lunch today I might have to throw caution to the wind and make one for dinner too. 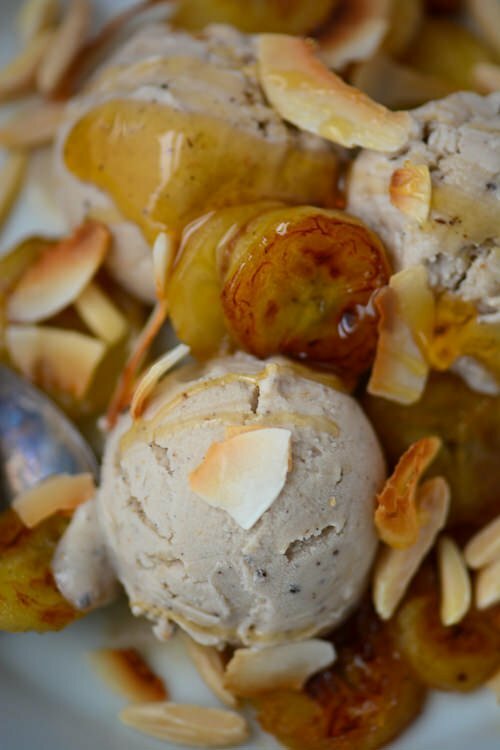 Vegan roasted banana coconut ice cream, caramelized bananas and toasted coconut and almonds make for an ice cream sundae the likes of which you have never seen. 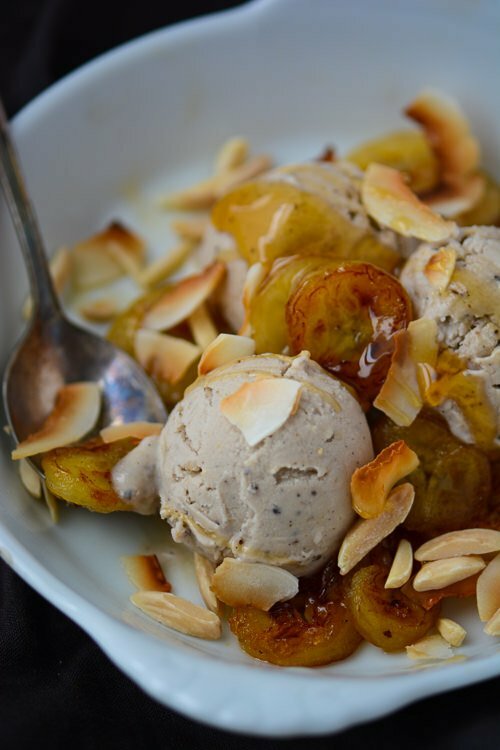 If you don't care about the dish being vegan take a shortcut with your favorite vanilla ice cream and it will be ready in less that 10 minutes. Slice the bananas into ½-inch pieces and toss with the vanilla bean, vanilla bean seeds, coconut oil, honey and salt in a medium baking dish or cast iron skillet. 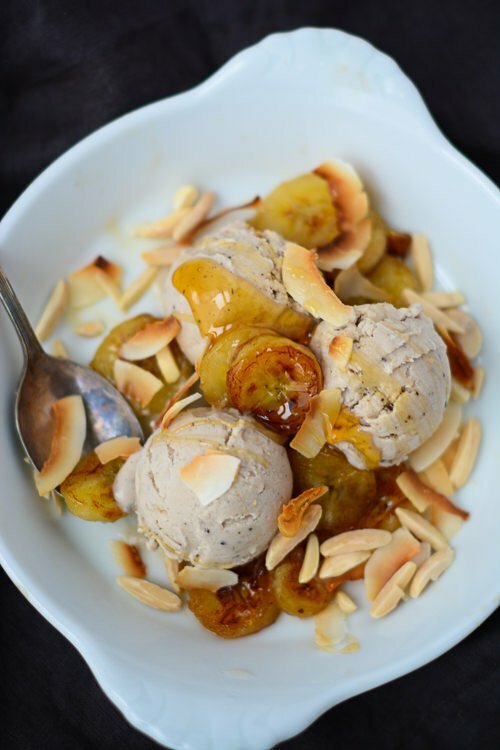 Roast for 35-40 minutes, stirring once or twice until the bananas are golden brown and slightly caramelized. Let the mixture cool slightly and then place in a high-speed blender or food processor. Add the coconut milk and lemon juice and process until the mixture is smooth. Fill a large bowl with a few cups of ice cubes and cold water. Chill the mixture completely by pouring into a ziploc bag and submersing the ice cream base in the prepared water bath for 30 minutes. Freeze the mixture in your ice cream maker according to manufacturer's instructions. Heat the coconut oil over medium-high heat. Cut the banana's into ¼ inch slices and add to the pan. Cook for 1-2 minutes on each side until the bananas start to turn golden brown. Meanwhile whisk the honey with the tablespoon of water and pour over the bananas. Cook for 1 minute to deglaze the pan. Set aside to cool slightly. On a baking sheet lined with parchment paper spread out the coconut flakes and almonds. Toast for 5-6 minutes until the coconut is fragrant and starts to turn golden brown. 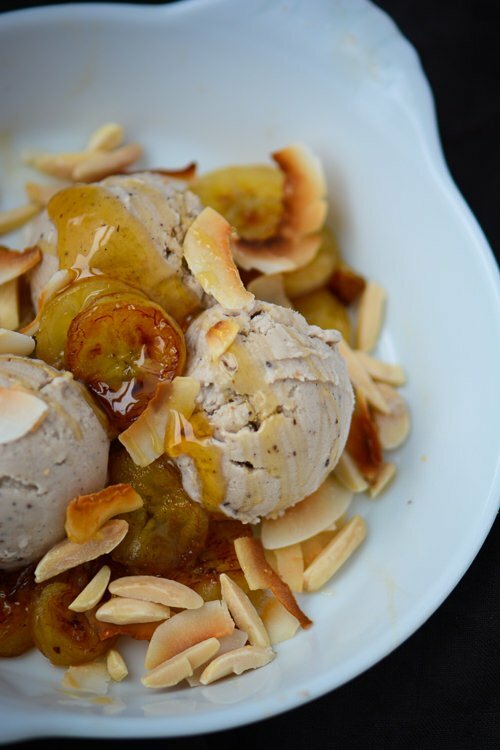 To assemble the sundaes place 2 scoops of the ice cream in a bowl, top with some of the caramelized bananas and garnish with the coconut and almonds. Drizzle with additional honey if desired.